This week's #Friday Reflection was to choose a quote that has touched me this week" and I thought of the one above about contentment - such an overlooked emotion in today's "give me give me" world of discontent. It seems everyone is looking for the next big promotion, the next big holiday, the next big romance or the next big crisis to keep things exciting. People constantly complain about the cost of living and how much they need to earn to live a life that they think is satisfactory. 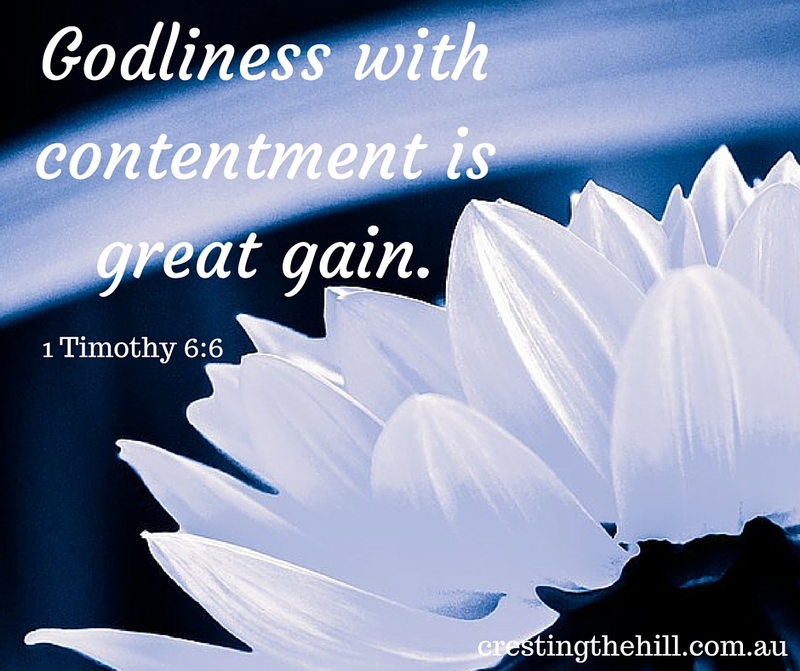 Contentment gets lost in the process. What I'm coming to appreciate is you can be happy with much less than you think. Young people need two incomes to get established and to ground themselves in their careers and to gain the experience they need to go with their qualifications. Those of us who are older can probably kick back a little and smell the roses if we choose to. 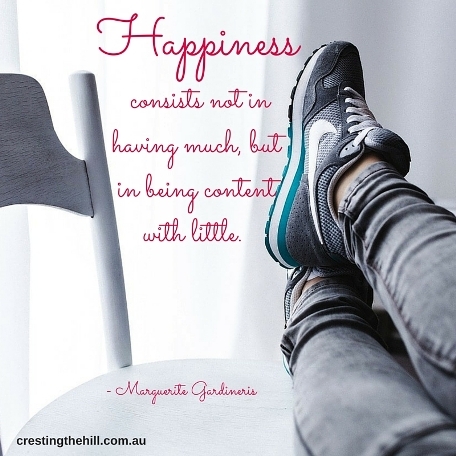 The constant pressure to earn more so you can spend more seems to be what drives this society we live in, but we can step back from that and claim some peace and contentment by choosing to be content with less. Perhaps we can take a page out of his book and appreciate what we already have without the need to constantly add to our possessions or our travel itinerary. By all means lets work if we like working, lets keep the wheels of commerce turning......but if you're like me, you might be getting a little tired of going to that thankless job to earn money to spend on things that maybe you don't really need. Reducing my work days by half has made no discernible difference to our quality of life. We still have all the food we need, we still have enough to go out and enjoy ourselves and we can still pay our bills with a bit left over. My motto has always been to spend less than you earn - and to pay off the mortgage as the first priority. This has been our salvation in so many ways, to be debt free is such an amazing achievement and to stay that way is even more pleasant. I'm prepared to sacrifice a few luxuries if it means I am not at the 9-5 grind every day - and the contentment that comes with having more time to myself outweighs any loss of income. In saying that though, I have to remember not to envy the lifestyle of others. I need to step back from facebook if I start to feel discontent when I compare my life to my wealthier friends. Life is all about choices and consequences. 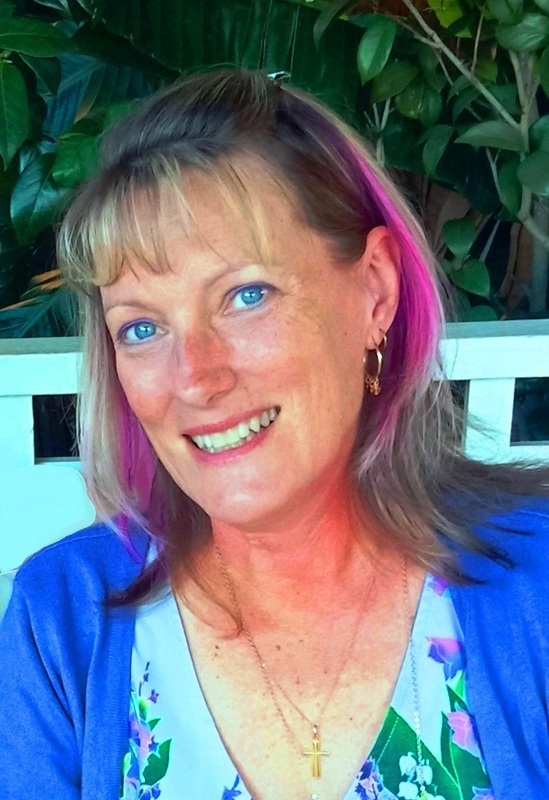 Making good choices that suit my mindset and free up my time is what my midlife is all about. that is so true Mackenzie - I'm sure the overseas vacations are lovely, but they don't compare with family time that is consistent and a parent who is available. The lure of money is a constant driving force in our world today and that is a little sad in my opinion. It's easier said than done, but definitely worth the effort! I love that Thoreau quote! I think there is a period of our lives where we have to put our heads down and our tails up and work Emma (or we'd all be living under bridges!) it's just recognizing when need changes to want and whether extra money is more important than having a little breathing space. Exactly this. Leanne, I love that you chose to write about this. My husband and I discuss this all the time. He gets paid hourly, and there are lots of extra hours available that he could work. But now that we're at midlife, it's all just going by too quickly, and we want to savor this time our childen our still with us. On our last day, what is it that we'll wished we had done more of? Not work more hours, that's for sure. Lovely post. I entirely agree Julie - it took me a long time to undo some of the conditioning that we need to earn and earn, and just let it go and find a balance where there is time to live life too. Oh Jodie...you are a woman after my own heart! I agree that there are times when being wealthy would be nice, but being relaxed and having peace is just as rewarding. I totally agree that a new pair of shoes can often make all the difference but I'll never be rocking any that cost a week's wages! Such an important message and one which resonates with me as I get older. I love the Scripture verse you included and am fortunate that God has blessed me with contentment. Good post! 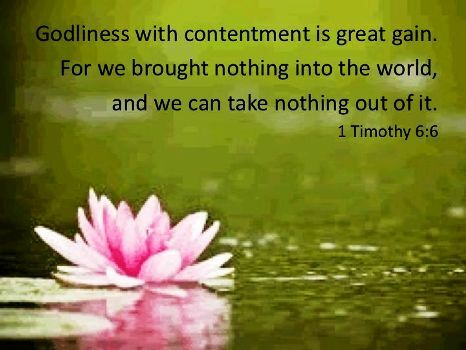 thanks Pam - I love that verse too and I think being blessed with contentment is one of the greatest gifts in life! I also discovered that reducing my work days did not leave me wanting! I was nervous about it, but somehow bills do get paid! Maybe it is age, but I am so much better able to slow down and enjoy things. I also find I am happy with buying much less. Thank you for you post. It puts me in mind of my grandmother's favorite saying: "Enough is as good as a feast." My mum used to say that too Mithra! And it's so true. It's a beautiful quote but so difficult to live by...As human beings, we tend to keep asking for more and more...If only we knew and lived by that principle..Things would be so much better! 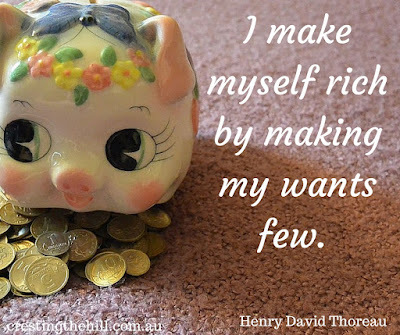 You get better at it as you get older I think - once we decide what it important (and that in my case is people and family and not material possessions) then we relax and the urge to buy decreases and you need less to be happy. This post was worth reading and is certainly worth sharing. I only wish I talked about this on my blog more often. Thank you. Thanks Barbara - I think a lot of us started with very little and found that happiness didn't depend on possessions - it was a good lesson to learn early in life! I do find that when I stop and pay attention to everything I'm grateful for, a peace washes over me, and in that moment I can breathe. That's so true Tara - if we take time to appreciate all that we have it takes away the pressure to keep striving for more than we need. I love the quote from Marguarite Gardiniras, and it is such a wonderful way to live if you can. Sometimes our choices are based on what life brings our way - not having a lot of spare cash seems to have been a constant in our life! but with a drop of gratitude you realize how little you need to be truly happy. Great post, Leanne, and so true. Because of our recent financial set back, we have had to do with a LOT less and you know what? It's not so bad. In fact, it HAS made life a little easier---even simplified! I find the same thing - my husband is never going to be a tycoon and as we get older I find that letting go of all the expectations and accepting that life is still pretty darn good makes things a lot happier. And ultimately we still have way more than we need! You're so wise. Last week I lost my favorite, go-to leather jacket. After backtracking everywhere, including the NYC cab I was in, my first impulse was to go online and find another one. A cursory look told me the few jackets I liked were way too expensive. Since the object of a jacket is to keep me warm, my less favorite jackets will be just fine, and who knows? Maybe one of them will become my new favorite. It's all about choices, isn't it, Leanne? My husband and I are pretty content with our decision to opt out of the rat race. We find that we always have more than enough. yes Corinne - it's about what you choose to value and not trying to keep up with the rat race. You know all my life it's always been about "tomorrow". Everything will be better tomorrow. We'll have more money tomorrow. Yet the circumstances haven't changed so I guess I have and I honestly think it's because of blogging. I've never been happier, more "content" than I have in the last two years. It's made everything in life better. It's made realize how truly blessed we really are.